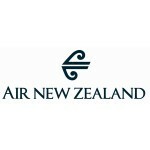 In 2004, Air New Zealand’s economy service from London, via Los Angeles to Auckland, had been touted as best-of-breed thanks to its 34” seat pitch. The reality had been a seat which was significantly less comfortable than those flown by competitor airlines, and disengaged service on the Transpacific sectors. On the return journey at least, the premium check-in area at Auckland Airport, direct access to fast-track security and a great food and drink presentation in Air New Zealand’s Koru Club lounge had been better experiences but, overall, it had been a disappointing series of flights. The airline’s first chance to make a better impression had come four and a half years later, from Perth to Auckland in Business Class, and had started well with a great (Qantas) lounge experience and then rapidly degenerated into a Kiwi comedy from which it was a blessed relief to see the curtain come down with disembarkation. All hopes were therefore pinned on this, Air New Zealand’s flagship ‘Business Premier’ 777 service, being third time lucky. 24 hours before our departure, NCC left on that day’s flight to Narita. She couldn’t use the direct access to security fast-track however, because the door was ‘broken’. Although it had been repaired by the following day, we couldn’t use it either, as the route is not wheelchair accessible. Instead, we were directed back out of the premium check-in area, to a lift and then through the normal route to rejoin fast-track (which we would by-pass anyway as an ‘assisted’ party). Check-in was eased by having filled in departure cards before we’d set off for the airport (a few having been snaffled the previous morning) and was reasonably swift. The entry to the premium area, at the extreme right of the general area, was (wo)manned by two uniformed staff but not policed at all, so I’m not at all sure that a non-status, non-premium passenger would actually be challenged. Departing NZ Premium Economy passengers are legitimately allowed also to use the facility though, which is a nice added-value to that service. Acquirral of the pre-booked wheelchair seemed to test the capability of the agent though, and it took a little while for her to understand that the wheelchair-less person sitting right in her line-of-sight, identified and referred to several times, did indeed require the wheelchair that had been pre-booked and, rather than from a blink, three stamps of the right foot and a click of some fingers, it would be required from Air New Zealand. When that finally seemed to sink in, she did quickly dash off to find one. Boarding passes issued, we found the relevant lift, pressed the appropriate button to the next floor up for Security and exited one floor above that. We got back in the lift, pressed the button again and exited back in the check-in area. A further yo-yo later and with patience expired, we asked the premium check in entrance (disre)guards how to get to Security since the lift was proving to be an altogether over-elevating experience. ‘Oh’, they said in unison, ‘it does that sometimes.’ Well, from this luggage-burdened, wheelchair-pushing, premium passenger: thank you very much indeed for that. You cannot imagine how helpful such information is. We ended up coasting over to the other side of the terminal building, up in a rather more disciplined elevator and finally through security. It’s then a further short walk, past Tie Rack, to the corridor leading to the airline lounges, another lift (or escalator should you be unencumbered) and then access to the Koru Club. As had now become the norm, we confirmed with the dragons that we’d need a pusher when our flight was called and we were invited to relax and we’d be found at the appropriate time. At 8am, the lounge was heaving, with the only available seats being in the ‘quiet’ area – ie no mobile phones, but still a completely integrated part of the lounge. A bit like one of those ridiculous ‘Nuclear Free’ signs that used to be put up by councils in the 1980s – usually within naked eyesight of the Atomic Power Station in the neighbouring borough. Despite the lack of capacity, a reasonably significant area was partitioned off for no obvious reason, and further space was taken up with some (unattended) third-party company’s massage chairs. The breakfast presentation was also disappointing, with nothing like the range of food that had been on offer for that evening departure back to London in 2004. Replenishment was slow or non-existent, milk had to be requested for the coffee machine – and at least some of the staff seemed out of their depth with more senior employees publically rebuking or audibly instructing lesser ones. Our pusher arrived promptly however, and galloped at speed through the terminal building to our gate. After just a few moments’ wait, we were waved through to pre-board and trundled down the jetty to experience almost 12 daytime hours of Business Premier service. At its launch in 2005, though arguably less so now, Air New Zealand’s new seat was particularly notable for its combination of both completely horizontal conversion, and direct aisle access for every passenger. At a stroke, two features hugely demanded by long haul passengers had been delivered. Of course, NZ weren’t first to market with this seat, as it is in fact a licensed (and slightly tweaked) version of Virgin Atlantic’s. And, as its 34” pitch Economy cousin did in 2004, it garners some very complimentary reviews. Passengers, particularly those who have made use of the London to Los Angeles sector, welcomed the horizontal seat in Business Class with which only British Airways could compete to the West Coast of the USA. For UK redeemers within Star Alliance Airlines’ loyalty programmes too, Air New Zealand’s direct service with London-based crews is therefore clearly preferable to, say, United or US Airways and, via European hubs, Lufthansa or SAS connections. The most obvious feature of the cabin layout which affords this direct aisle access is its ‘herringbone’ pattern. This means that no seat is, effectively, ‘next’ to another. Rather, every seat is behind or in front of another, so the occupant looks diagonally forward to someone’s feet emerging from a cross-aisle seat, or directly in front to the rear three-quarter view of someone’s lughole. It’s therefore quite private for lone travellers, but less convenient for couples or more. Passengers on the outboard seats in the cabin, though nominally adjacent to the windows, will actually find that the portholes are behind them and a slight distance away, which may not suit the avid cloud-watcher. Once seated, the next most obvious characteristic of the seat is that it is one that ‘converts’ to a bed, rather than one that ‘becomes’ a bed and, in practice, the difference may be significant. To explain, the general modus operandi of the pre-existing Business Class horizontal beds such as BA’s, and most (though not all) of those which have been developed since, is for the seat to recline in one largely continuous motion until it is completely flat – usually linking up with some kind of ottoman or footstool. Virgin and then Air New Zealand’s solution, however, is for the seat to only recline partially, and for it to be flipped-over in its entirety to form a bed. 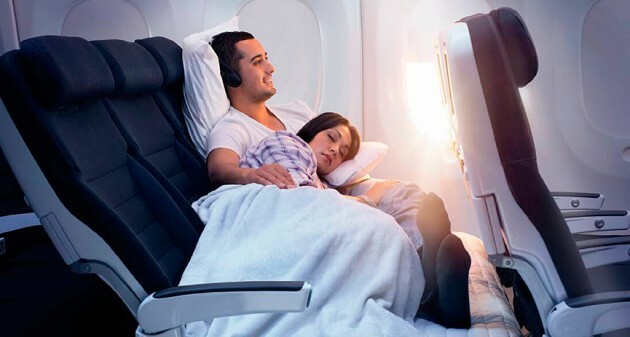 On a long overnight flight, this may in fact be perfectly satisfactory, but even then for some – and on daytime flights for many – this limited seat recline and necessity to make a conscious decision to ‘convert’ to the fully flat bed could be tedious. Each individual seat is upholstered in soft, dark grey leather and housed in a pale grey plastic cocoon, the superstructure of which houses the next rearward passenger’s table and TV screen. The seat itself, despite its very limited recline, is reasonably comfortable – although those neck-craning outboard passengers may notice that their seats are actually tilted ever so slightly sideways, as if the cabin floor is cambered. That leather does get clammy, too. With three crew on this sector, no First Class on Air New Zealand and 26 seats in the Business Premier cabin, service should be good and we’re promptly offered assistance and a welcome drink – water, orange juice or sparkling wine – by the all-male team. As priority and general boarding progresses, it becomes apparent that the load in this cabin was going to be very light indeed. In fact, as the doors were closed and the cabin was prepared for departure, just 12 of the available seats, each of which had been prepared with the generous Air New Zealand amenity kit and slippers, had been taken. The crew suggested that we may wish to spread out around the cabin, but since the problem for the pairs of travellers amongst us was too much separation from our companions already, hemmed as we were into our seat coffins, separating ourselves yet further seemed quite pointless. The lone travellers seemed already well-dispersed. 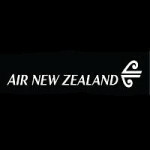 Once in the air, it became apparent that whilst amenity kits had been laid out for every seat, not one seat had a copy of KiaOra, the airline’s in-flight magazine in its pocket. Neither were there any in the cabin magazine rack. For the 12th of the month, this seemed odd – and further investigation proved that neither the previous day’s service, nor the one on the 28th of the same month, carried any KiaOras in the Business Premier cabin. One was eventually to be found in Economy on the 28th. The Flight Service Manager worked his way round each passenger with a short welcome and, as it later transpired, he was a most personable chap. He clearly wasn’t terribly comfortable with the structured small-talk however, although whether that belied a lack of training or some other disinclination, I’m not quite sure. Either way, it didn’t add much value. The Auckland to Narita in-flight service schedule begins with ‘Wake-up Drinks’ followed by Breakfast, then a ‘Light Refreshment’ and finally Dinner prior to arrival in Tokyo. We know this because that’s what the provided menu says. That the ‘Wake-up Drinks’ are served at almost 10am, suggests either a remarkable aptitude amongst Business Premier passengers for unconscious travel to the airport, check-in, security processing and boarding, or another one of those over-enthusiastic copy-writers in some darkened bunker of a Marketing Department, far, far away from reality or an airline passenger’s life. Preparation for the meal service revealed a huge, stable, dining table, the downside of which was that its structural heft meant that every time it was released or stowed, the adjacent coffin-dweller (in whose wall the table is mounted) shifted visibly. Perhaps that would have been a good reason to have spread out a little, after all. Breakfast began with beautiful fresh fruit and greek-style yoghurt, prepared and served from the galley in a generous bowl, although un-specified cereals were apparently also available. From the main course selections, which also included a Japanese option of Grilled Salted Salmon or Cinnamon Spiced Brioche Toast, the Three Cheese & Chive Omelette was chosen, which was pre-plated and not terribly well-presented. The attendant spiced tomato chutney completely over-powered the omelette, both in taste and quantity. Following the meal service, the crew retreated to the galley, where they more or less stayed for the duration of the flight, other than when serving. It’s one of the realities of life in service industries that, when there isn’t a lot for a staff to do, they tend to retrench and do almost nothing – and that’s really what happened here. With 12 passengers and three crew on a daytime flight, there would have been the opportunity to really engage and pamper but, apart from that walk around by the Flight Service Manager, there was only the odd silent patrol of the aisles. The reality is a pretty thin collection of esoteric nibbles and some warm water – a far cry from the similar presentations made on British Airways, Qantas and Cathay Pacific, to name but three. That said, the crew, huddled away in the galley, were more than willing to make drinks and provide fresher offerings, and to chat merrily away at length with any passenger who parted the curtain. They were a lovely trio and much more relaxed in their sanctuary – but once out in the cabin they reverted to that slight awkwardness that comes from not being quite sure whether they are there to serve, as their Operations Department instructs, or be the passengers’ ‘mates,’ as their bunker-bound Marketing Department would have them be. It was most obvious on this flight with so few passengers, but with hindsight you could see that both the Perth crew and perhaps even those 2004 Transpac crews had suffered from the same stiltedness. Indeed it might be suggested that it’s a bit of a wider Kiwi trait. New Zealand is, at heart, a pretty conservative and traditional place, yet it’s being promoted by the country’s tourist board, its airline and countless other exporters as being as effortlessly laid-back as some perceive their Australian neighbours to be. In doing so, some of these service providers end up being a bit like a middle-aged father trying to be hip with his kids, frustrated that he’ll never actually be that cool and also uncomfortable with betraying his more mature natural leanings. It certainly felt that way on NZ99 and what a shame too, because the crew were genuinely great folks. Next up on the in-flight service, following that fairly large breakfast, should have been our ‘Light Refreshment’ so it came as something of a surprise to see an obviously more elaborate preparation being undertaken by the crew. For, in their wisdom, they’d decided to switch service and bring dinner forward to a late lunch, leaving the ‘Light Refreshment’ for later. A bar service commenced first, with a no-choice starter of ‘Japanese Appetiser Selection’ being served immediately following that. GCC, being less-than-adventurous in such matters, skipped that but I can report that it was delicious. Perhaps as an homage to the Japanese obsession with miniaturisation, the tiniest side salad yet seen on land, sea or in the air was also located on the tray, but only with the aid of spectacles. Main courses consisted of Pan Seared New Zealand Beef Tenderloin, or a Japanese Dish of Grilled Citrus Pepper Seasoned Chicken & Prawn, or Kumara and Ricotta Ravioli. From this, the Beef was selected – served with roasted herb potatoes, green beans and red pepper pickle. It was, to be honest, very average and the potatoes had been about as roasted as it is possible to be in a pan of boiling water. Dessert, again, was a choiceless affair, although a separate cheese course was offered. The sweet-toothed creation was a Pavlova With Whipped Cream, which had all the textural delight of a mouthful of ash. Whoever thought that a dish that is risky enough at sea level could be fired to 35,000 feet and somehow turn out reliably well should be provided with the business card of a good careers’ advisor. The cheese plate was a far more successful endeavour; far from abundantly generous but streets ahead of the almost stale and pre-packed Singapore Airlines effort. Top marks for that. Having lost the will to live scrolling through episode number 28 of ‘The Flight of The Conchords’ in a vain attempt to get to anything vaguely interesting, a risky press of the ‘play’ button revealed that this most (only?) successful New Zealand TV export was actually even more soul-destroying than scrolling through the individual summary pages for each episode. Beaten, I was then about to be cowed by the coffin seat which, of course, wouldn’t recline much beyond an Economy inclination. Not wanting to restrict myself to being flat out and therefore in an unsuitable position to read the non-existent in-flight magazine, or watch the introduction page slowly pass for episode number 41 of The Tedium of Comedies, the best that could be achieved was frequent visits to the toilet, the empty magazine rack and the buffet of warm water, so as to revel in the joy of being able to leave and return to the coffin with direct aisle access. What fun. Some way out of Narita, the Captain turned on the Fasten Seat Belt Sign, in anticipation of, it was reported, some possible bumpiness ahead. With a steadiness otherwise characteristic only of being on stand at the gate, the 777 ploughed on Northwards, with nary a tremor to its wingtips. The continuous illumination did allow the crew, however, to de-rate the remaining cabin service (the re-scheduled ‘Light Refreshment’) to paper cup level. Well, they were rushed off their feet, weren’t they, the poor (New Zealand) lambs? The ever-smoother flight continued with our descent towards Japan and Tokyo Narita and, once on the ground and at the jettied stand, the crew were once again back into uncomfortable rote mode. Thankfully, we were disembarked quickly from the half-empty cabin and our friendly white-gloved pusher was waiting for us at the aircraft door. 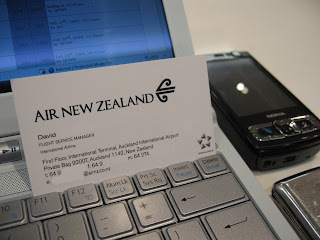 Final Verdict for Air New Zealand Business Premier: 6.5/10. Given that there’s such a gulf between the 767 seat and this 777 bed, the difference in scores between Air New Zealand’s Business Class and Business Premier should have been far more marked – especially as the BP flight didn’t suffer from the boarding and seating shambles of the Perth sector. However, the same poor IFE, overall very average food with a choice of main course only, a lack of basic cabin amenities and a crew who did very little over and above the minimum – and then still appeared to switch service around to suit themselves – conspires to add a mere half point to the Perth score. The seat, for a day flight, is simply not comfortable or versatile enough – even compared to a wedgie or a good cradle seat. On an overnight sector, the potentially more usable flat bed conversion and lack of requirement for service might have brought the score up to touch 7.0, but not on this flight. Priority Luggage tags did at least do their job and our bags were off the belt quickly. Overall then, an unremarkable effort with more than a hint of style over substance, and not one which would appear to objectively deserve more than a ‘well, you could possibly do worse’ type of recommendation.